Some of the greatest records of all time such as I'll Take You There, Brown Sugar, When a Man Loves a Woman, I Never Loved A Man the Way That I Loved You and Mustang Sally all have one in thing in common, they are just a few of the tens of thousands of pieces of music created at Muscle Shoals, a place alongside the Tennessee River, Alabama. Jimmy Cliff, Bob Dylan, Aretha Franklin, Etta James, Alicia Keys, Wilson Pickett, The Rolling Stones, Bob Seger, Paul Simon, The Staple Singers, Lynyrd Skynyrd, Percy Sledge and countless other stars have all been lured to this remote and mystical place in the backwoods of Alabama to work with the musicians and producers there. In the critically acclaimed new feature documentary, Muscle Shoals, directed by Greg 'Freddy' Camalier, we are taken to a place filled with magic and music, legend and folklore where the river is inhabited by a Native American spirit, who has lured some of the greatest Rock and Roll and Soul legends of all time and drawn from them some of the most uplifting, defiant and important music ever created. In Muscle Shoals, music runs through the hills, the river, and the spirit of the people. At the heart of this tale is Rick Hall, the founder of FAME studios, who created a haven for black and white musicians to come together in service of music. Doing so at the peak of racial hostilities, he shepherded the creation of songs and even genres that have become seminal while also giving birth to the unique "Muscle Shoals sound" and the rhythm section The Swampers. Raw and candid interviews, a rich and soulful soundtrack, live performances (that include a new recording by Alicia Keys at FAME studios of a Bob Dylan track originally recorded in Muscle Shoals), and the magic of the milieu itself capture and convey this tale. Through this amazing story and music, the viewer will be taken on a journey that begins in the backwoods of Alabama and unfolds the soundtrack to their life. 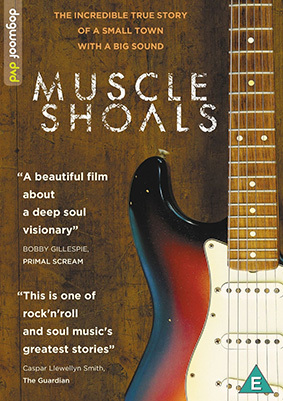 Described by Bobby Gillespie of Primal Scream as "A beautiful film about a deep soul visionary," Muscle Shoals will be released on UK DVD on 10th February 2013 by Dogwoof at the RRP of £14.99.